Holiday China Tour is an online travel service department under Guilin Yangshuo International Travel Service. Holiday China Tour offers a selection of tour programs to suit every traveller; various city combinations, a range of durations and many included sights. We endeavour to provide access to all aspects of China's beauty as well as covering such popular attractions as the Great Wall and the Forbidden City in Beijing, the Terracotta Warriors in Xian and cosmopolitan Shanghai alongside stunning natural beauty found in Guilin and Yunnan Province, ect.. Join Holiday China Tours your holiday of a lifetime. 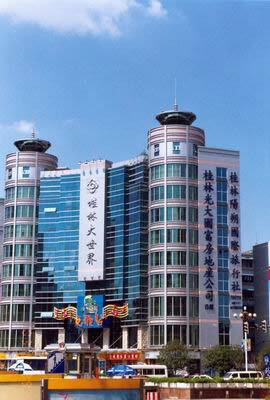 The Service Scope Hotel reservation, domestic and international air or train ticket booking, ticket booking, transfer service between airport or train station and hotels and guide service for both sightseeing and visit. The dept also handle travel arrangements between cities, optional tours, temporary tours, regional package tours, international conference and convention and other special interest tour all over China. A Long History: Guilin Yangshuo International Travel Service Co. Ltd.. has been enjoying an unrivalled reputation at home and abroad, we were the first organization to host overseas tourists as well as the first to offer package and FIT services to Chinese traveling abroad. Guides of Fine Caliber: Employees in Guilin Yangshuo International Travel Service Co. Ltd. are college graduates working as guide interpreters in 12 foreign languages including English, Japanese, German, French, Russian, Thai, Arabic, Spanish, Italian and Korean. Extensive Business Scope: Guilin Yangshuo International Travel Service Co. Ltd. handles travel sales and outbound tours, international conference and convention, sale of domestic and international air tickets and train. tourism promotion and taxi service. Other businesses include travel related trade, economic and technical cooperation and real estate development, etc. 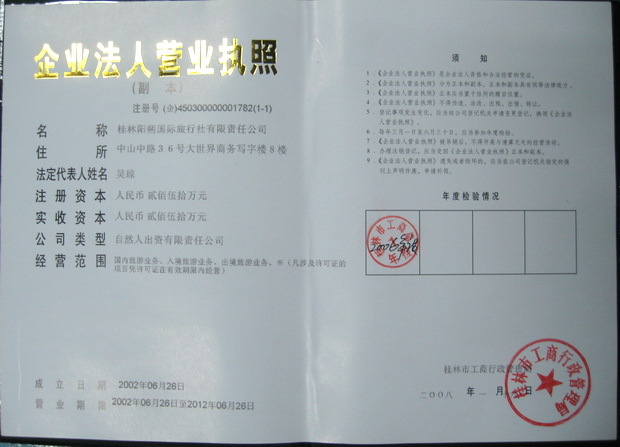 Quality Service:Following the principle of " Guest first and reputation first ", GUILIN YANGSHUO INTERNATIONAL TRAVEL SERVICE CO. LTD. can cater to visitors for first-rate service in all respects. Guilin Yangshuo International Travel Service Co. Ltd. has the following strength:The Department of Holiday Tour is responsible for overall tourists marketing and business. It consists of Japanese Dept. , North American Dept., Asian and Pacific Dept., Korean Dept. and Production Development Dept. 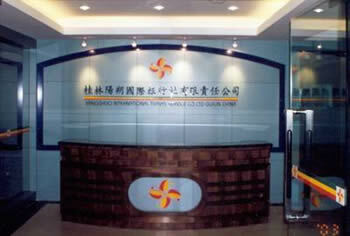 The Center is engaged in the sales and marketing of China tours and ground arrangements in Guilin and other cities in China. Its business scope covers: package, incentive, special, optional, individual and family tours, etc. The center now has kept close contract with many travel organizations in the world and enjoys good cooperative relationship with tourist circles, airlines, travel agencies and hotels in China. Reception center takes care of all the matters and problems that might occur in reception. Mainly provides services for individual tourists, staff and families of diplomatic missions and foreign business offices in China. The service include: hotel reservation, domestic and international air or train ticket booking, theatre ticket booking, transfer service between airport or train station and hotels and guide - interpreters for both sightseeing and visit. The Dept. also handle travel arrangements between cities, optional tours, temporary tours, regional package tours and other special interest tours in Guilin area.